In a shocking twist, the marriage of convenience between a failed steak salesman and a foreign supermodel seems to be faltering as Donald Trump’s presidency progresses. 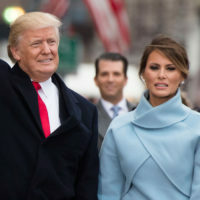 Flipside sources inside the White House (of which we have many) revealed earlier this week that while Donald Trump was rambling at the State of the Union, the state of his marriage was “not good”. There’s much speculation as to why this could be happening. Some point to the fact that Melania did not sign up for this whole presidency thing when she agreed to be his third wife, a position she probably did not expect to last this long. Others argue it’s because Donald is definitely thinking about Ivanka during two and a quarter minute love making sessions with Melania. All agree, however, that this marriage, much like Trump’s aforementioned steak business, was a mistake you could see from a mile (or as Melania prefers, kilometer) away.